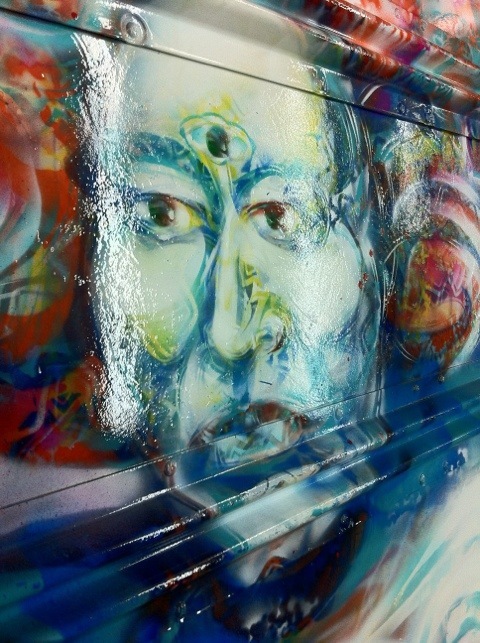 This post features a community mural commission project I designed and painted last summer. My philosophy is simple, make something that reflects the spirit of the community. Typically I interview the business or community and following that I will draft a mock-up so everyone can get an picture in their mind’s eye. Although on commercial murals we tend to copy exactly from the original artwork (that includes the colours and the compostion) I like offer a simple picture that shows the composition. This gives us some room to work with the imagery and it allows for some creative flexibility. This is my third largest independent mural to date, it took one month to complete thanks to some much needed help from my partner. I like to use vibrant colours in all of my murals. I keep my colours stocked because quite often I will ask those who pass by what their favourite colour is and will add it as long as it flows well. This really excites people and they makes them a part of the process. I like to both mix my colour and use prefab colours. I have been rolling with Golden products lately they have great colour selection and also make a special aribrush medium that promotes adhesion to the surface, which is helpful on sea cans and smoother surfaces. An important step for me is a nice finishing coat. This protects the mural from the elements, and human nature. I don’t like to compromise to much when it comes to my independent murals but given certain budgets one has to be resourceful and learn to work with what you have. I really try hard to make sure nothing goes to waste and I use a layering technique with my paint that allows me to use a little less paint overall, although it is a little more labour intensive. 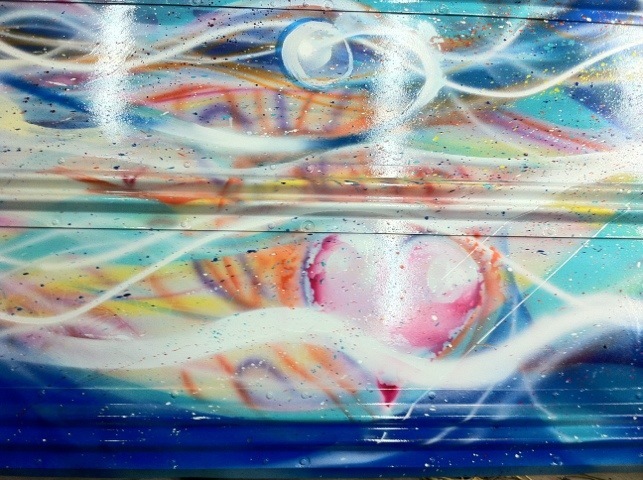 Also I only had two airbrush guns working on this one, a medium and large format, I find two brushes is easier to maintain and keep clean, the more guns you use the more you have to clean, and cleanings a huge part of murals, there’s no way around it. The last thing I do is apply a topcoat that protects from the weather elements and also human nature. My murals is art for the people. I put a lot of pride into my work and although it is a lengthy process, when it is complete the feeling is like no other. inked mock up and tools of the trade and the office/lab where the mixology goes down. Tags: art, calgary public art, commission work, field art, Golden paints, hälts art, Mahaloness, mural, professional, public art, vibrant | Permalink. -I find myself surrounded by an ever complicated world created by us and to which we serve. In being here I will honour my time left in service to humanity and pledge to continue to share my life’s work and artistic explorations and otherwise through the Mahaloness channel. There may be a few changes coming, as time permits, and life exists. Thank you to all and may love continue to be our companion along the way. let’s take a peek inside the studio. a repeat here on Mahaloness, this is a drawing I made in 2006, I recently rediscovered this one in my collection, and feel it’s fitting for the times. 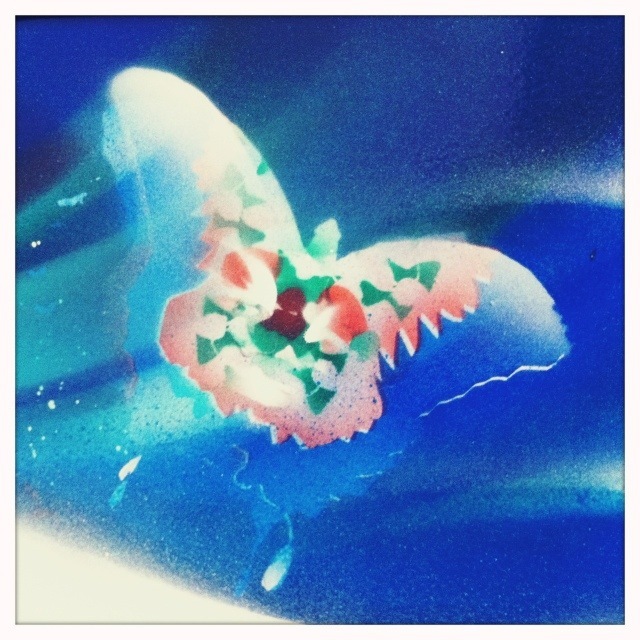 All art on here is copyright hälts, aka Mahaloness. all rights reserved. Tags: art, cosmic, desert painting, enjoy, Golden paints, Mahaloness, present, red oxide, watercolour | Permalink. 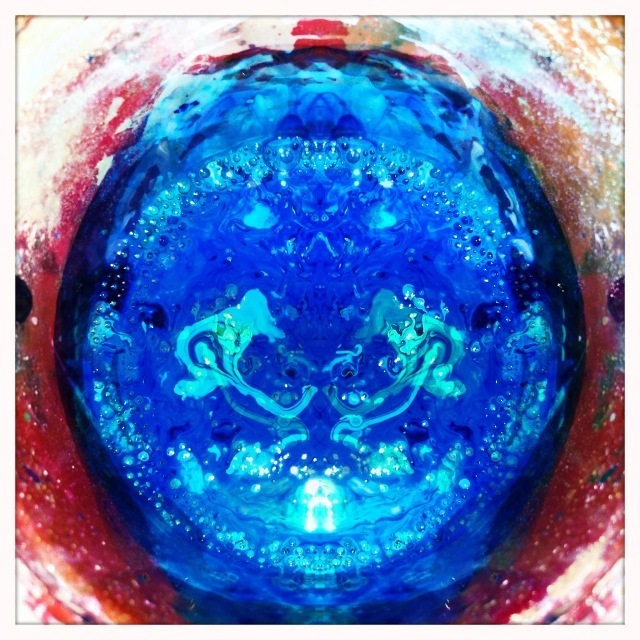 Tags: art, cobalt teal, edvard munch, Golden paints, Mahaloness, the scream | Permalink. Remember that not always getting what you want is sometimes a wonderful stroke of luck. First and foremost thank you. 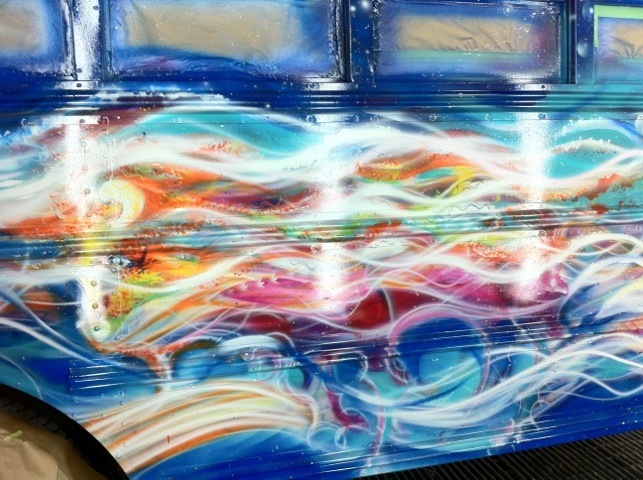 I was asked to paint a school bus, I agreed and the rest is history. 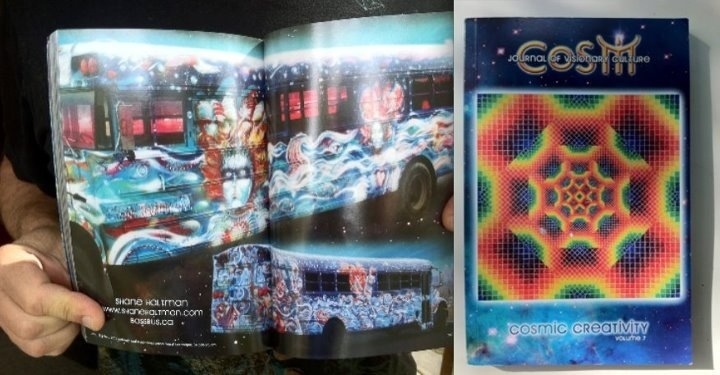 The art on the bus is derived from moleskine doodles, made mostly in Maui, Aloha spirit, with exception of the Chief figure, who represents a man from the Siksika nation (near Cluny AB, where my grandfather lived). The Chief is in likeness to a man my grandfather hunted with, and lived next to, both of which I never had the fortune to meet. My grandfather’s name was Julian Nobert. He was known to the local people as ‘the Great White Chief’ which I see as a huge honor and is why that ended up on the bus. 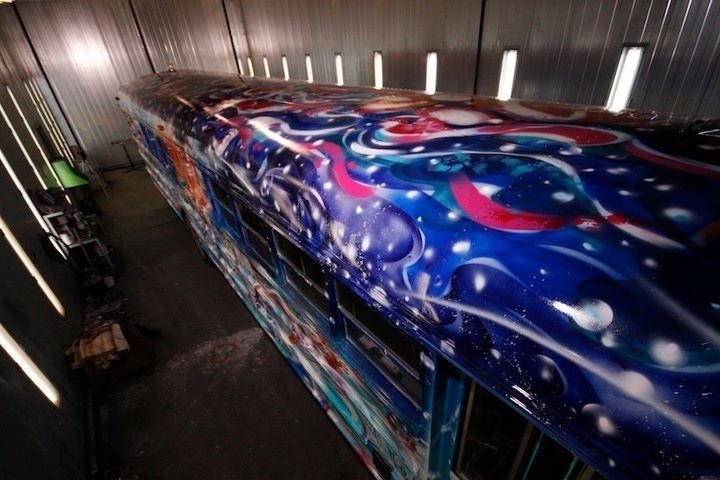 The entire bus is airbrushed, using various tricks and techniques, all made from scratch in the green building in the image section, which was in the middle of no where, without heat, except for a van, which had a space heater in it, and which I used for sleeping and cooking. I had to walk for water 2 three times a day, a fairly good distance, carrying full, warm water back to my setup station for cleaning and keeping paint warm, a lot of work in itself. 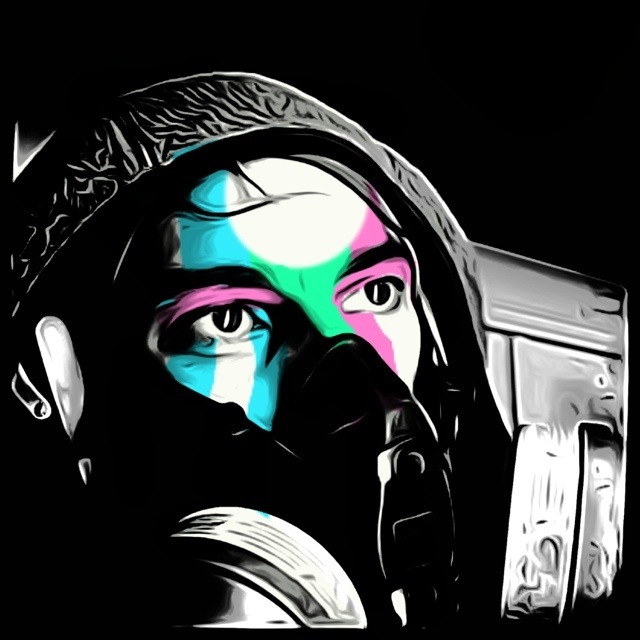 Mix colours, fill guns, run compressor, paint, empty gun, clean, reload, paint….you get the idea, every colour in the rainbow, 7 to be exact. As the job progressed my whole minimal housing setup, a camping van that house billions of bacteria, even before I got it. As the job progressed I was overtaken by very healthy mice, even though there was a shop cat in the building. 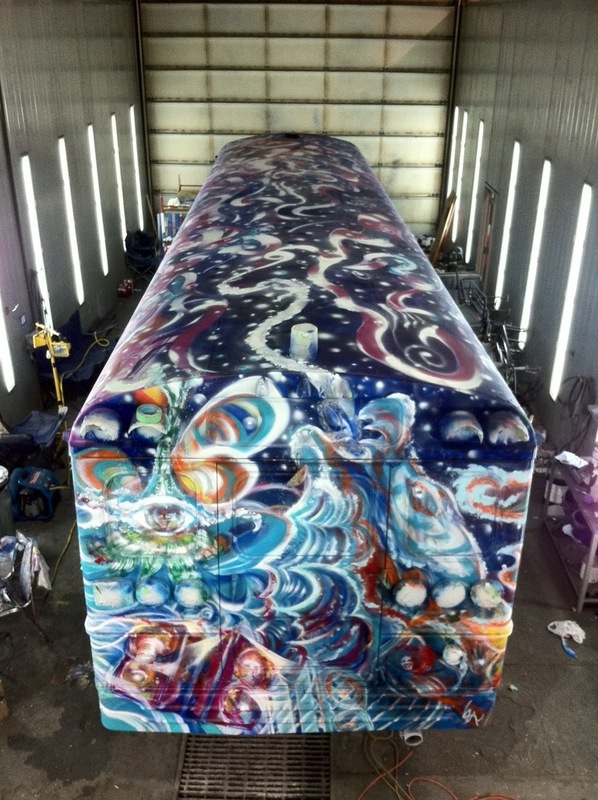 The painting bay was too narrow for me to see the sides of the bus which made the job extremely difficult and nearly impossible, except a balcony section where I could view the top, which I made into a universe. So how’d I do it? Well I drew everything on to the bus first. Some of it I projected, and the rest was hand drawn once I was happy with the scale, I find that once you get the scale the rest comes pretty quickly. 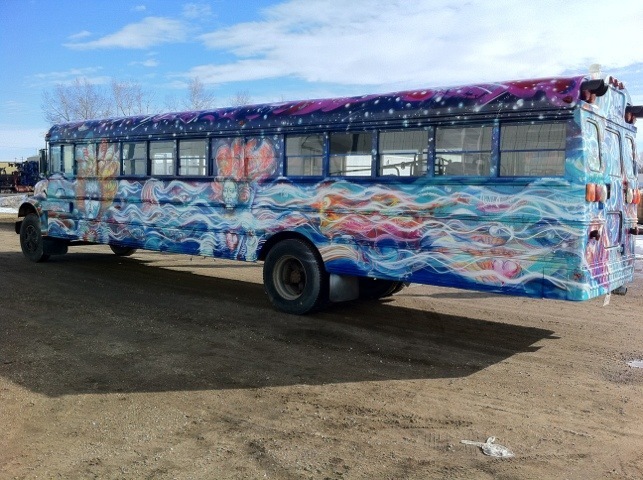 The bus took me three months to paint, not every day, but anywhere from 3 to 10 day stretches, 8 to 36 hour shifts, and a very good diet, thanks to some deliveries made by the client. The conditions were not favorable at all. 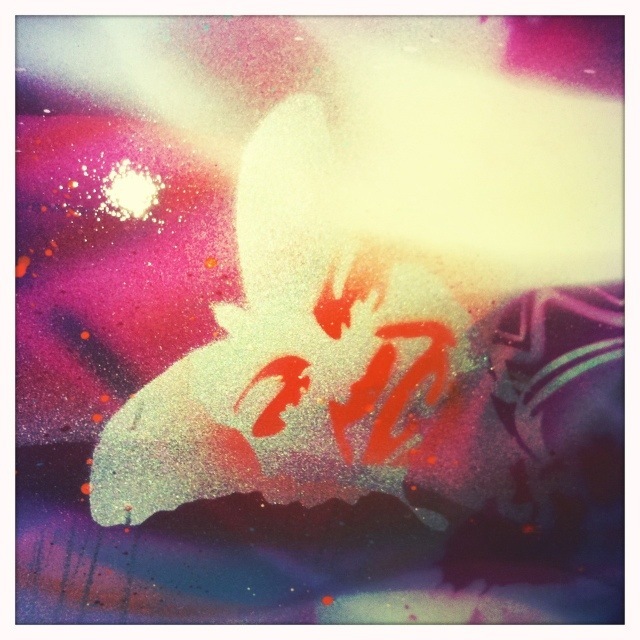 Air brushing in cold climate is not easy and certainly not the best way to apply paint. I used Golden fluids, they don’t come cheap, however cheaper and more efficient than spray cans, also Golden fluids layer better and I could control the paint consistency and add medium that suited painting a shiny tactless surface. I was always told to trust your drawings, and that actually saved a lot of time, considering the scale of the bus, which is around 1100 sq. ft of area to paint. I also primed the whole thing first after the client had gone over it with sanders and worked on some of the problem areas. I actually did use some aerosol, not as efficient and Golden’s products, they are simply the best, in my opinion. The wolf on the back is my spirit animal, I had a dream of the wolf and proceeded to paint 18 hours strait to finish it. Every detail on that bus was thoughtful and shaped. As a painter I am a mark maker and I made the best marks I could, which is not to say they are the best in the world, that simply means I made my marks count. Talent only takes you so far, at the end of the day this thing was work, and in the end it was a labour of love, my mind, body and spirit were beat. It was no doubt a real dream project, all of the ingredients to be something awesome and truly public art and effecting like a giant billboard is, except unlike advertisement some medicine for the mind, body and soul. It is interesting to me that I am the artist that some like to dislike, and perhaps that is due to my passion and intensity, and I stand for artists getting the value they deserve. I put every ounce of my heart, mind and soul into this project because thats how I roll. The work speaks keeping in mind there is no comparison between a digital foto and seeing the real thing. It is quite difficult to capture all the details in a single frame; to see it in real life one can literally dive into the layers. 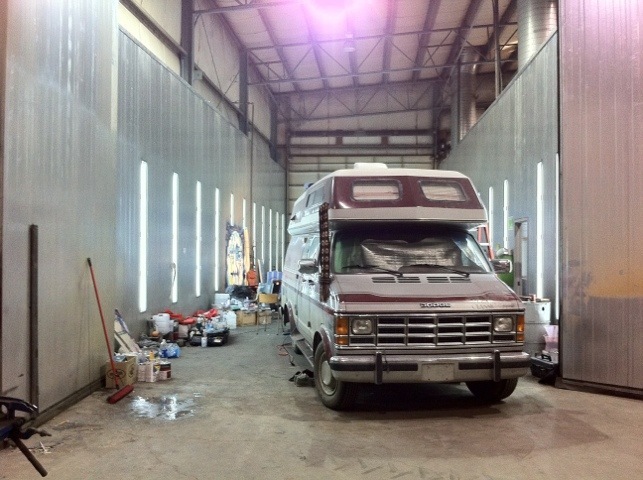 An earlier entry on the bus project…. A list to consider….made at the completion of working on the bus, things to consider, always make a wish list. Please share if you like, pass it on. 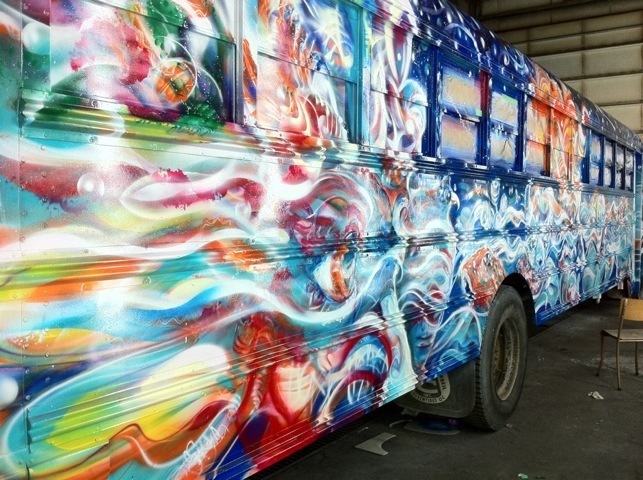 Eat and live by these basic guidelines while painting a magic bus. Here is a list to get things going (some tangents apply). -chips (kettled cooked crinkle salt and pepper) which are really bad for you, but good in moderation. -electric kettle (coffee, and heated water to clean airbrush) I had no heat inside, so I had to heat the water constantly, which meant going through more water than normal. Each time I had to change out water I went with two 2-gallon water containers… 200 steps to and from the water source, up to 4 times a day- this is a great workout, and mental practice. The water source was far away, never a good thing for a painter. It was located in a separate part of the warehouse, often dark with no lights on, which I eventually adapted to and could do it practically with my eyes closed… on occasion I did. On one occasion I was in headphone mode, and someone had strategically placed a 4 gallon bucket of something heavy in my previously clear path. My shin crashed into it- a zen moment for sure. -really good tequila (sipper) for when you complete the day and you made some serious progress, for the good pain. -mate (salad in a cup I am told) is always good, and a detox tea. You work with chemicals when you paint so keep this in mind. Always flush and do what feels right for the body… okay well, most of the time. -projector, which helps for the large scale stuff. Go ahead and work without one if you want, but a bus has many multi-dimensions. Good luck. -Kit Box! Paint, brushes, paint, brushes, mediums, various tools for throwing, mixing. You name it, every artist is different. Go with what you know, and learn what you don’t… leave that part up to other people, and you may be missing some big awesome surprises. 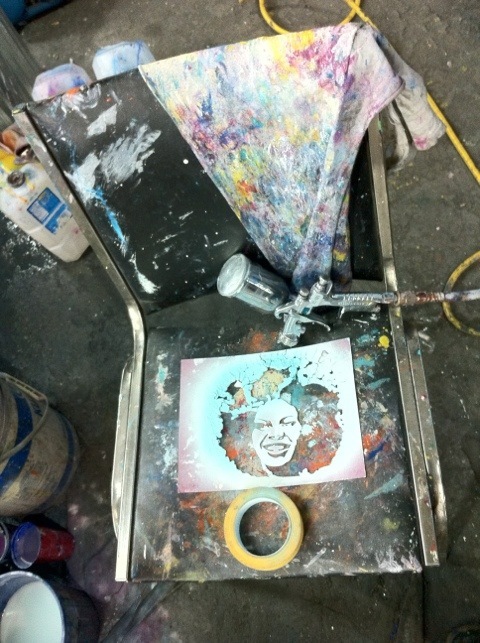 Be willing to sacrifice, but remember that paint is expensive- use it smartly and always clean your tools. Put excess paint back into vessels… it is worth it on any scale project. I have only really learned this recently, so get your paint in bulk, which means pre-plan. 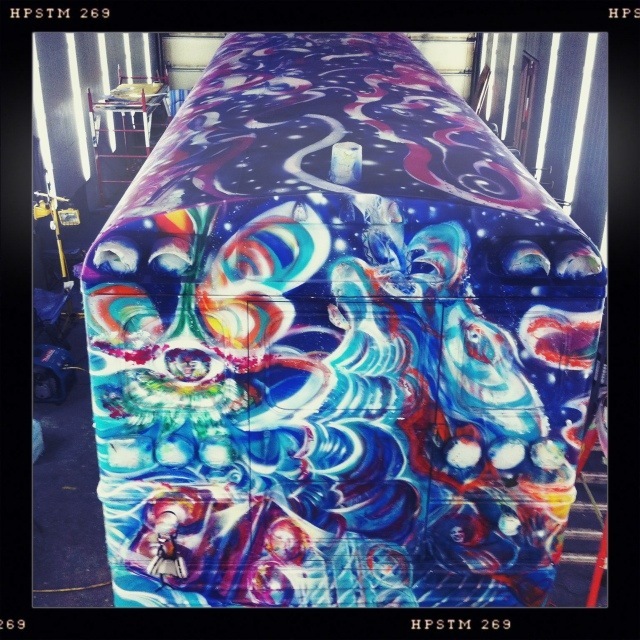 Know your dimensions and how much paint it will take to cover a large object. No need to rush that part, it will only cost you in the long run. Save yourself and/or your clients money- it is a good idea. -music, and lots of it. 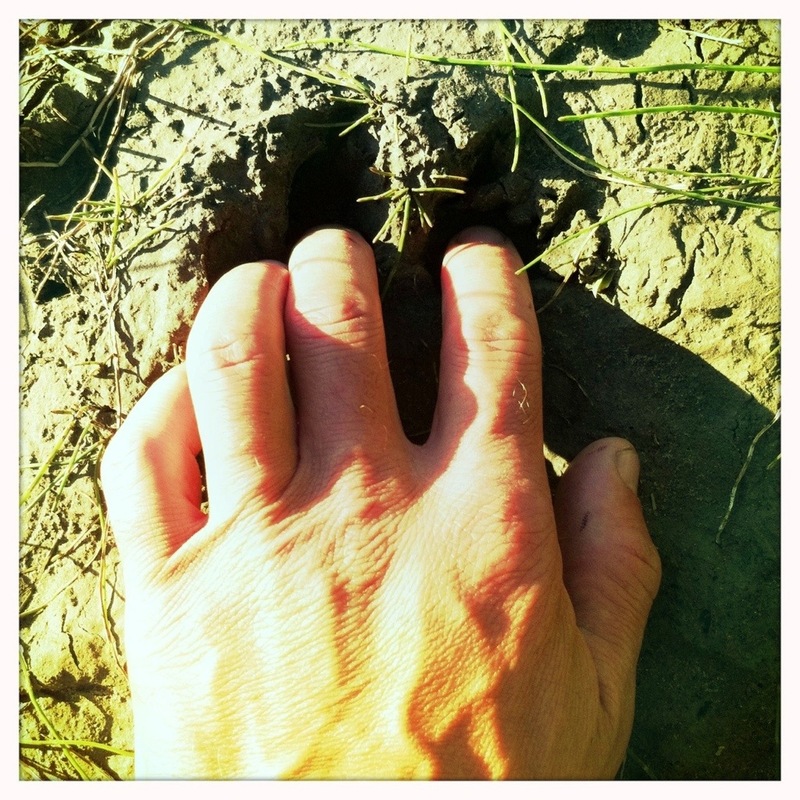 I like the podcasts… there are many, and the music that is going on around the world is amazing. Also sing while working alone, or whistle- it keeps things good. -I chose to work really long days and sessions, because days became less relevant as the time progresses. You quickly learn to make your energy count, really! Unfortunately some parts of the list have been exempt, and when the time the right time comes to present them, I will. Okay now, paint a bus! Wait… next entry. Tags: 3-D, art, dream, Golden paints, Mahaloness, Murals | Permalink.